Squid ink pasta may seem like a weird ingredient, but this dish is absolutely delicious. Rich pasta combined with crisp shrimp makes for a tasty, elegant meal. In a skillet, heat oil over medium-high heat. Add shrimp and sauté for 1 minute on each side until opaque. Remove from pan, and set aside. Add garlic to skillet. Cook for 2 minutes or until golden, stirring often. Add in red pepper flakes, black pepper, salt, wine, tomato, and parsley. Cook for 8-10 minutes over high heat until reduced by half. Add lemon juice and butter. Return shrimp to skillet, mixing well. Cook pasta in pot of salted water until al dente. Drain well, and place in skillet. Toss well. This is an ideal treat - optimal for entertaining guests and showing off your culinary prowess. 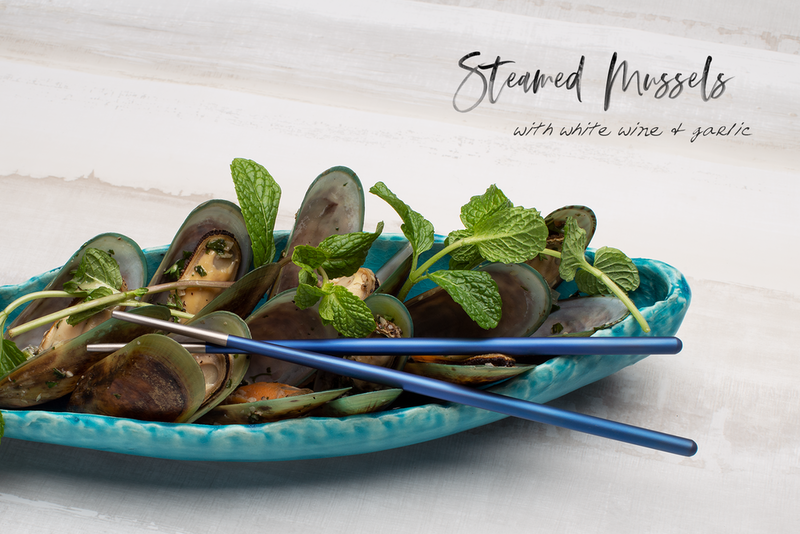 White wine, shallots, and garlic combine together to form the perfect broth for steamed mussels. Of note, it is important to remember that when cooking mussels, if any shells are prematurely open before cooking, discard them. 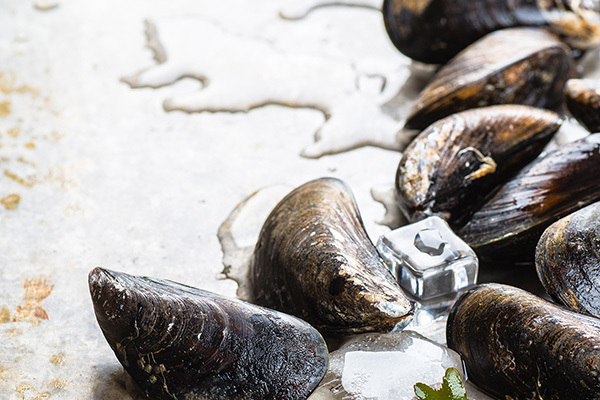 Additionally, once cooked, if any remaining mussels have not yet opened, they should be thrown out as well. Plate the mussels in a big bowl - don’t forget bread on the side so you can sop up every last drop of the delicious broth. Melt butter in a large pot with lid over medium heat. Once the melted butter begins to bubble, stir in the prepared shallots and garlic. Cook until softened for about 5 minutes. Next, add the chicken stock, white wine, and mussels to the pot and give them a good toss. Cover the pot with its lid and cook until all mussels have opened, about 6 to 10 minutes. Discard unopened mussels. Remove the pot from the heat. Stir in the cream and parsley. Be sure to take time to taste the broth and adjust to taste using salt, pepper, and/or more cream. Serve with lemon wedge. This one is super simple and fast - the perfect weekday meal. All you will need is one skillet, a few fresh ingredients and soon enough you’ll have a creamy, sun-dried tomato, chicken spaghetti for dinner. Bring an 8-quart stock pot of water to a rolling boil and generously season with salt - do not skimp. Cook pasta according to package instructions until al dente. Drain, reserving 1 cup pasta water for sauce modifications. Return drained pasta to the pot. Meanwhile, preheat a large pan over medium-high heat. In a medium preparation bowl, douse chicken with olive oil and season with salt and pepper. Grill chicken on the pan until juices run clear, roughly 5 to 7 minutes on each side. Immediately transfer to a plate and cover loosely with foil, allowing the juices to set. In a large skillet over medium heat, add 2 tablespoons olive oil and garlic; cook until garlic is softened, about 3 minutes. Next, add chopped fresh tomatoes and sun-dried tomatos. Season with salt and pepper. Stir with a wooden spoon over medium-high heat for 5 minutes. Finish by stirring in the heavy cream and Parmesan. Toss spaghetti and basil with sauce. Serve pasta on a large platter. Garnish with more Parmesan and basil. A healthy meal the whole family is sure to love! An omega-3 rich, simple salmon supper that is easy to prepare and likely to impress. Best of all, let the kids choose how much heat they’d like by serving hot sauce on the side. Start by whisking together the ginger, garlic, soy and vinegar; set aside. Heat a large pan or wok, adding 1 tbsp oil. Next, add the vegetables and salmon, frying the salmon for 2 mins each side until it begins to turn opaque. Add to the rice and stir, making sure to flake the fish into large pieces. Move everything to the side of the pan to make room for the next steps. Add the remaining oil to the pan; crack eggs into the pan and stir to roughly scramble them. Once cooked, stir through the rice and pour over the soy marinade. Season and leave to simmer for a few mins more, allowing all the rice to become coated in the sauce. Serve in bowls with hot sauce for drizzling. Time to take a trip to South East Asia! This classic Vietnamese summer roll is both lovely to look at and delicious to eat: tasty Cha Lua (fermented pork ham), fragrant herbs, and rice noodles bundled in a soft rice paper wrapper make this dish one of a kind. Mix all sauce ingredients into a medium bowl. Can be prepared 1 day before consumption. Cover and chill. Start by placing all the noodles in a large bowl. Pour enough hot water over to cover; let stand until softened, about 10 minutes. Drain noodles and transfer them to a large bowl of ice water to cool; drain and set aside. Next, it is time to prepare the rice wrapping. Fill a pie plate with warm water. Working with 1 rice paper sheet at a time, soak the rice paper in the water, turning occasionally, until it is just pliable but not too limp, about 30 seconds. Transfer soaked rice paper to a work surface. Next arrange 3 shrimp halves across the center of the sheet. Top with various leaves of each herb, followed by daikon sprouts (if using), cucumber, and carrot. On top of that arrange a small handful of noodles. Place 1 lettuce leaf over, torn or folded to fit. Fold bottom of rice paper over filling, then fold in ends and roll like a burrito into a tight, compact cylinder. Move each roll, seam side down, to a platter. Repeat to make 11 more rolls. Whisk olive oil, lime juice, tequila, garlic powder, Cajun seasoning, seasoned salt, and black pepper in a bowl; pour into a resealable plastic bag. Add shrimp, coat with the marinade, squeeze out excess air, and seal the bag. Marinate in the refrigerator for 1 to 4 hours. Preheat an outdoor grill for medium-high heat and lightly oil the grate. Soak wooden skewers in a bowl of water for 30 minutes. Remove shrimp from the marinade, and shake off excess. Discard the remaining marinade. Thread shrimp on skewers, piercing once near the tail and once near the head. Arrange skewers on preheated grill; cook shrimp until they are bright pink on the outside and the meat is no longer transparent in the center, 6 to 8 minutes.